Sphere of Influence: Rain, Storms, Thunder, War, and Winds. Symbols: Bear, Drum, Eagle, Girdle, Ram, Spear. Veträ is the most widely worshipped deity throughout the Trollenmere. 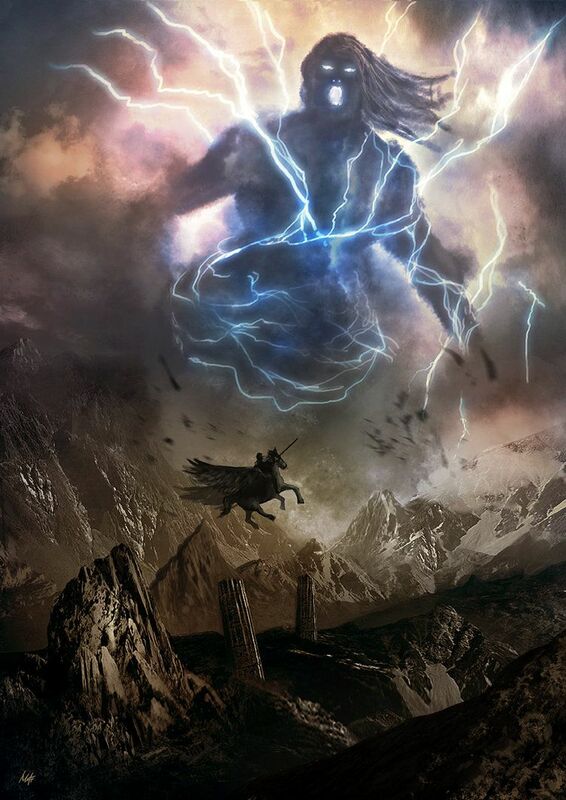 He is the storm god, whose spears are as lightning and whose shield blows are as thunder. The distant rumbling on the winds of a storm are the wheels of his ram-drawn chariot as he bolts across the sky. He is the embodiment of the male ideal – strong, courageous, thoughtful, wise, steadfast, and forthright, but his one failing is his love of women – particularly mortal ones. He is renowned for his numerous affairs with mortal women, and the extreme jealousy it inspires in his wife, Sieva. More than for his lecherousness, Veträ is known and worshipped for his strength, prowess, and unshakeable courage in combat. He wears a magical girdle that grants him tremendous strength and bears a metal shield of such weight that no other being can lift it. He often takes the form of either a tall, powerfully-built man with a scruffy red beard or a particularly large bear. As the embodiment of the male ideal, Veträ blesses those who hold themselves to a similar standard. Thus his priests should be willing to sacrifice for those they protect – Selfless or Sense of Duty (Nation) –, honest – Truthfulness –, and honorable – Code of Honor (Gentleman’s or Soldier’s). Unlike other deities who enjoy blood sacrifices, Veträ prefers sacrifices of weapons. This is represented by Disciplines of Faith (Ritual Sacrifices) specified to weapons and has the same effect of doubling weekly cost of living to pay for those sacrifices. Furthermore, it is appropriate to sacrifice the weapon of a fallen opponent in thanks for one’s victory; treat this as Trademark (Break opponent’s weapon) [-5]. The spirits who serve Veträ are all War spirits, but those who embody storms also take Fire, reskinned as Lightning, or Air. A natural companion to warrior spirits is Fear, as are Good and Evil, depending on how malicious they are. Nature fits those servitors who embody raw forces of nature, like storms. And while the Winged lens would not be out of place, it is not prevalent enough to suggest that it’s the norm, either. Veträ’s shrines typically resemble great halls with an alter on the dais where the lord would normally sit. There, broken shards of weapons are placed in offering, alongside horns of mead and roasted hog. Such shrines are common places of gathering for feast and celebration by warriors, who will go as far as to build such shrines in staging grounds while at war. Rites performed in these halls usually involve feats of strength, grappling, drinking, and eating. In pantheons, Veträ stands above his alter with spear in hand, bearskin on his back, and an eagle perched upon his broad shoulder. His alter holds a large, cauldron-like brazier in which offerings are placed. Advantages: Remove Animal Friend, Channeling, Green Thumb, Licensed Exorcist, Medium, Spirit Badge, Spirit Empathy, Spirit Weapon from the list of optional advantages and add Combat Reflexes , High Pain Threshold , and Striking ST 1 or 2 [5 or 10]. Skills: Remove Herb Lore, Hidden Lore (Faeries), Naturalist, Pharmacy (Herbal), and Poisons from the list of optional primary skills and add Jumping (E) DX+1 -12; Running (A) HT -11; Throwing (A) HT -11; and Weather Sense (A) IQ -13. • Remove Diagnosis, Research, Surgery, and Veterinary from the list of optional secondary skills and add Armoury (Armor or Melee Weapons) (A) IQ-1 -12; Carousing (E) HT -11; Connoisseur (Weapons) (A) IQ-1 -12; Lifting (A) HT-1 -10; Naturalist (H) IQ-2 -11; Savoir-Faire (Military) (E) IQ -13. • Add Polearm (A) DX+2 -13; Two-Handed Axe/Mace, Two-Handed Flail, and Two-Handed Sword, all (A) DX+2 -13 to the melee weapon options. • Remove Blowpipe, Bolas, Lasso, Net, and Thrown Weapon (Stick) from the ranged weapon options and add Thrown Weapon (Axe/Mace) (E) DX+1 -12. • Remove Cartography, Disguise (Animals), Fishing, Mimicry (Animal Sounds or Bird Calls), Navigation (Land), Survival (and), and Traps from the list of optional background skills and add Fast-Draw (any) (E) DX -11; Knife (E) DX -11; Skating (H) HT-2 -9; Skiing (H) HT-2 -9; Soldier (A) IQ-1 -12; Swimming (E) HT -11; and Tactics (H) IQ-2 -11. Cleric of Veträ: Either Power Investiture 2  or Divine Favor 5 . • Choose [-10] points from disadvantages mentioned in Morality, above. • 15 points total in any combination of Power Investiture 3 , Divine Favor 6 or 7 [5 or 15], Learned Prayers, or clerical spells. Advantages: Add Divine Favor 4, 5, or 6 [10, 15, or 20], Lifting ST 1-3 [3/level], and “or Learned Prayers” to the list of optional advantages. Skills: Add Weather Sense (A) IQ-1 -9 to the list of optional background skills. PI 1 Bravery, Coolness, Darkness, Detect Magic, Extinguish Fire, Fear, Iron Arm, Lend Energy, Lend Vitality, Might, Purify Air, Quick March, Recover Energy, Sense Foes, Sense Life, Share Vitality, Shield, Silence, Slow Fall, Thunderclap, Umbrella, Vigor, Warmth. PI 2 Air Jet, Armor, Aura, Awaken, Cleansing, Command, Create Air, Create Water, Final Rest, Gloom, Grace, Great Voice, Haste, Light, Minor Healing, Mystic Mist, Predict Weather, Purify Food, Purify Water, Resist Cold, Resist Disease, Resist Lightning, Resist Pain, Resist Pressure, Sense Spirit, Shape Air, Soilproof, Wall of Wind, Windstorm. PI 3 Animal Control, Astral Vision, Breathe Water, Clean, Clouds, Command Spirit, Hawk Vision, Lightning, Magic Resistance, Oath, Rain, Relieve Sickness, Resist Acid, Resist Fire, Restore Hearing, Restore Sight, Restore Speech, Stop Bleeding, Strengthen Will, Summon Spirit, Terror, Truthsayer, Turn Spirit, Walk on Air, Watchdog, Wind. PI 4 Affect Spirits, Body of Wind, Cloud-Walking, Compel Truth, Continual Light, Control Air Elemental, Create Food, Cure Disease, Dispel Magic, Dispel Possession, Explosive Lightning, Fog, Hail, Lightning Weapon, Neutralize Poison, Relieve Madness, Repel Spirits, Seeker, Sunlight, Suspend Curse, Turn Zombie, Vigil, Weather Dome, Wisdom. PI 5 Astral Block, Banish, Bless, Concussion, Create Air Elemental, Curse, Divination, Flight, Gift of Tongues, Great Haste, Great Healing, Lightning Whip, Major Healing, Remove Curse, Storm, Summon Air Elemental, Suspend Mana. PI 6 Bind Spirit, Cloud-Vaulting, Drain Mana, Entrap Spirit, Lightning Missiles, Lightning Stare, Pentagram, Planar Summons (Divine Servitor), Resurrection, Sanctuary, Wall of Lightning. Veträ answers prayers regarding physical power, masculinity, and weather. His priests bring rain to drought-stricken areas, wind to stranded sailing ships, and deluges to their enemies, and his holy warriors are as an unstoppable force of nature on the battlefield. Abilities Affliction, with Stun and Secondary, Heart Attack; Alternate Form (Body of Air); Burning, with Surge and Side Effect, Stunning; Combat Reflexes; Control (Weather or a subset), with Natural Phenomena; Crushing Attack, with Environmental (-5%); Damage Resistance, with Limited, Air (-40%), Limited, Electricity (-40%), Limited, Elemental (-20%), or both Force Field and Limited, Physical (-20%); Detect, for weather, clouds, rain, storms, etc. ; Doesn’t Breathe; Energy Reserve (Heroic Feats); Enhanced Move (Air); Hard to Kill; Hard to Subdue; High Pain Threshold; Lifting ST; Obscure, if justifiable as fog, snow, wind, etc. ; Piercing Attack, for hail; Pressure Support; Recovery; Resistant to any kind of inhaled threat; Sealed; Striking ST; Telekinesis, with Environmental (-5%); Terrain Adaptation, for mud, slippery, or other weather-induced ground conditions; Terror; Vacuum Support; Vibration Sense (Air).